Jesus came as we know it to die for the sins of the world, and to reveal the Father. 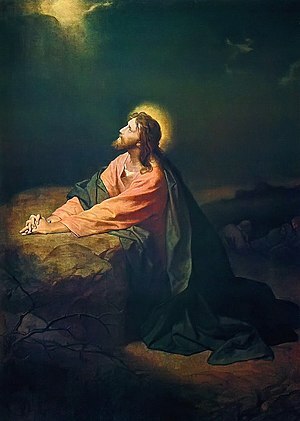 For many Jesus is the one through whom we can reach God, while God is the Father hidden from view. In our deepest thought we wish to see God, and because we have no understanding of scripture we view God as always hidden from humanity. To the contrary God is not hidden from Humanity, rather God was indeed Jesus in human form. Isaiah spoke of this before the coming of Jesus Christ, and Matthew wrote of this in the first chapter of his book. Isaiah wrote, “And all thy children shall be taught of the Lord; and great shall be the peace of thy children.” Isaiah 54:13) Matthew told us, “Behold, a virgin shall be with child, and shall bring forth a son, and they shall call his name Emmanuel, which being interpreted is, God with us.” Matthew 1:23) Paul also went on to say, “ But as touching brotherly love ye need not that I write unto you: for ye yourselves are taught of God to love one another.” 1 Thessalonians 4:9. Clearly Jesus is God according to scripture, but as we look at His humanity and listen to His words, and take note of His purpose we will begin to unfold the mystery of His coming. Jesus we know came to die that He might redeem us from the power of death. In-other words we could say, “Jesus came that He might redeem His sons from the power of death and within Himself glorified His children. He accomplished this by offering His body as the substitute for ours that He might present a perfect man acceptable to God on behalf of man. Jesus in His death has cleansed us from our sins, and doing so present us before God the Father, as sons worthy of the kingdom, worthy of the throne, and worthy as sons. In- other words God came down that He might cleanse His sons, forgiving their transgressions and returning to the throne of heaven present us in heaven in human form before all His angelic hosts as sons, hires to His throne. By glorifying the human body, God the Father has redeemed humanity from the judgment that is upon the world, against the seed of the serpent our accuser; removing all guilt and charges brought against us by our accusers, and have silenced the prince of the air, and those working with Him restoring His sons to glory and power in himself. From the beginning we were sons of God made in His image and likeness, sons who had fallen, sons who came under judgment, sons subjected to death, but as it was appointed God the Father came in the form of man that He might redeem His own. The term Son of man used by Jesus was to point to this reality of God restoring glory to His sons in himself by His death and the glory of His resurrection. For this reason Jesus said, ” Now is the Son of man glorified, and God is glorified in him. If God be glorified in him, God shall also glorify him in himself, and shall straightway glorify him.” John 13:31-31.) in- other words, “Now is the Son of man, or body glorified and God is glorified in the body. If God be glorified in the body, God shall also glorify man in himself, and shall straightway glorify Him, or Adam.” By glorifying the body being in the body God has both brought glory to Adam and to himself in Adam. By this we are now sons of God, in God, and God in us. I agree – God is not hidden. I am a bit confused as to why you use a picture of Joseph Smith whose heresy taught that Jesus is not God as equal, the same and as one when your article teaches that Jesus and God are one. I thought of that, I will change that photo. I couldn’t at the time find another to show examples. Thanks. OK. I have had people point such things out to me that I had done and I appreciated it.